THE HIGH LINE RIDERS with Bumping Into Nothing! After 18 years the High Line Riders are back on the Americana Rock stage. High Line Riders? Admittedly, it’s been a while and perhaps only true fans will remember this New York City band and their only album Somewhere South Of Here from 1997. But hearing their full name from back then – Ed Pettersen & The High-Line Riders – the penny should drop: Ed Pettersen has had a remarkably interesting career as an extremely versatile musician ranging from singer/songwriter, folk, power pop, rock to electronic music and freestyle jazz. With his brand new album Bumping Into Nothing and the revitalized band name he appears well-prepared for a return to good ol‘ rock’n’roll with meaty lead vocals, loud guitars and excellent, catchy songs! 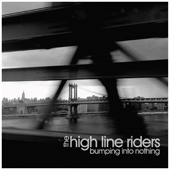 Sounding like this, the High-Line Riders are an ideal fit for Blue Rose Records. 53-year-old Ed Pettersen, born in New York City with Norwegian roots, started his musical journey as a folkie songwriter in the mid-90ies. He had grown up listening to outlaw country music, Pete Townshend and Paul Westerberg, Springsteen, Oasis and Steve Earle. His 1995 debut was called Desperate Times and brought him into contact with the Brandos and the Del-Lords, two of the hottest New York acts at the time. He broke through in 1997 with his new-found band The High-Line Riders and the acclaimed album Somewhere South Of Here – simply great, twangy rock’n’roll with strong songs, strong musicians and a big city attitude. No Depression magazine – tastemakers then and now – wrote: „“As comfy as an old pair of jeans““. Because of a hereditary disease Pettersen was unable to tour continuously. Thus, the High-Line Riders era was short-lived. At the beginning of the new millennium, Pettersen revisited and reissued older, partly unreleased material. In 2001 he released an overhauled remake of Desperate Times, two years later a sampler entitled Two T’s All E’s, a dummy’s guide to spelling his name. At this time, Pettersen had already moved to Nashville. In 2002 his band The Strangelys only album Spare Bedroom was released. The band featured the Abbott-brothers Mike (lead guitar) and Pete (ex-Average White Band, drums) – both of them also members of The High-Line Riders – and played complex power pop fusing influences of Oasis, Fastball and Creed. Pettersen also had tracks on tribute albums to Waylon Jennings and Son Volt and then stepped it up three notches as the creator, lead producer and contributing musician in Song Of America, a three-CD set from 2006 dedicated to American history and featuring such acts as John Mellencamp, Blind Boys Of Alabama, Black Crowes, Mavericks, Andrew Bird, Old Crow Medicine Show. This project brought him more appreciation than his entire previous output. Riding this wave of success in 2007 he released The New Punk Blues Of… – exquisite, handmade, original songs between urban folk and songwriter rock. Currently, Pettersen is busy as ever. As Mad King Edmund he is into freestyle music, experimental jam rock, noise improv, electronic Americana and avantgarde jazz. His 2012 opus Happening: A Movement In 12 Acts is a highly political free jazz operetta featuring recitations by Walter Egan, Charles Walker, Suzy Bogguss, Freedy Johnston, Mary Gauthier, Matthew Ryan and many others. It deals with the USA’s economical and moral decline and the influence of the Occupy movement. Shortly thereafter, Pettersen was drawn to folk music once again. After researching his Norwegian roots he released I Curse The River Of Time: A Norwegian American Tale in 2013. A special edition with an elaborate hardcover book combines the beautiful Americana folk music recorded by hand-picked musicians from Nashville and Norway with Scandinavian literature and illustrations. Pettersen’s last baby was entitled Nashville Electric. This 2014 album comprises experimental feedback/ drone/psychedelic and electronic instrumentals – extremely weird. And today we witness his glorious return to straight, no-frills, guitar-driven rock’n’roll, American-style. It’s not for nothing that Pettersen is using the High-Line Riders name again even though only drummer Pete Abbott is back in the saddle. David Santos plays bass, Gary Goodlow lead guitar and Mike Brenner (known for his work with Low Road, John Train, Marah, Magnolia Electric Co., Slo-Mo) on lap & pedal steel as well as electric slide guitar. Bumping Into Nothing was recorded in Nashville but sounds a lot more like NYC and the Brandos, Del Lords, Willie Nile, Steve Wynn, Eric Ambel and others. Recording legend Bob Olhsson who worked for Motown (Marvin Gaye, Stevie Wonder) and the Grateful Dead provides a substantial r&r sound. Jen Gunderman (Sheryl Crow, Jayhawks, Paul Burch, Eric Brace/Peter Cooper) plays piano and organ, friends like Freedy Johnston, Chuck Mead (Ex-BR549), country singer Joanna Smith, Norwegian songwriter star Henning Kvitnes, the Farewell Drifters und and young Norwegian folkie Ida Jenshus lend their voices. ‚Every Time It Rains‘ has everything an album opener needs: Three singing electric guitars, formidable lead vocals and a catchy chorus. It’s followed by ‚Cold Comfort‘, a powerful mid-tempo rocker. On ‚Janey‘ Pettersen plays the extrovert shouter. ‚Bumping Into Nothing‘ with its Springsteen/Seger/Mellencamp vibe is an ideal title track, ‚Holding Pattern‘ is a little darker. ‚I Hope You’re Happy Now‘ is an upbeat number with steel guitar, segueing into the bluesy lament ‚Jason Molina’s Blues‘ – a tribute to the late charismatic leader of Magnolia Electric Co. ‚You Can’t Get There From Here‘ is a steel & twang-filled ballad followed by the uptempo rockers ‚I Don’t Think About When You Were Mine‘ and ‚Small Town In My Mind‘. ‚I’m Where You Were‘ is a slow duet with Joanna Smith and pretty jingle-jangle guitars. The boogie-piano number ‚Hard On Me (Out Of Innocence)‘ and an alternate mix of ‚Cold Comfort‘ round out the album. Ed Pettersen and his fabulous High-Line Riders have hit the bull’s eye with this album! THE HIGH LINE RIDERS mit Bumping Into Nothing! Welcome to Blue Rose: ALECTRO debut with School Of Desire!